Makes a spectacular wedding or shower favor when you pair it with our Lollipop Wrapping Kit. WILTON-Lollipop Mold. With this lollipop mold it's a breeze to create great tasting treats for any occasion! The mold is constructed of a flexible and reusable plastic and features five cavities in two designs. Just melt your candy melts, mold, cool, and serve! 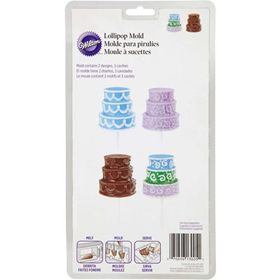 This package contains one Tiered Cake mold. Candy melts sold separately.